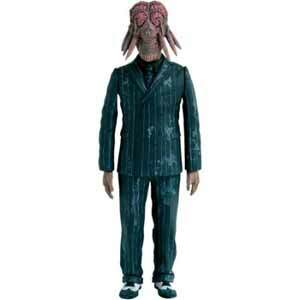 Anyone who is a fan of Doctor Who will be pleased to learn that Character Options range of Series Three action figures are as impressive as ever. The detail on the Dalek Sec Hybrid toy is one of the best I've seen - which is quite remarkable when you consider that the character was just a rubber headed alien in a suit. 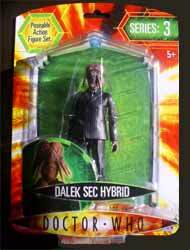 Dalek Sec Hybrid was seen in the Daleks in Manhattan episode, where he absorbed a human form by combining Dalek and human DNA, enabling him to live outside his protective casing. The paint job is way better than you should expect for a £7 toy. The suit is covered in stains, which look incredibly, and the tie not only has red spots on it, but there are flecks of silver in the red paint too, so it catches the light. The end result is more a labour of love than a cheap plastic toy made in China, that seem to clutter the shelves of most toy shops these days. Thankfully, once again, Character Options treat fans with a little respect and have produced a toy that will be embarrassed by kids and collectors alike.